British Columbia Teachers’ Federation, January 27, 2014– Teachers across BC are celebrating today’s ruling by the BC Supreme Court, reaffirming that provincial legislation limiting teachers’ bargaining rights is unconstitutional, restoring collective agreement provisions stripped in 2002, and ordering the province to pay $2 million in damages plus court costs. Iker noted that the legislation was already declared unconstitutional in 2011, and the judge gave government one year to rectify the situation. However, government simply reintroduced the same unconstitutional provisions. By removing class-size limits and class-composition guarantees, the government did significant damage to learning conditions in schools across the province. The legislation removed provisions that guaranteed smaller classes, support for students with special needs, and services from teacher-librarians, counsellors, and other specialists. Government then cut hundreds of millions of dollars a year from public education budgets, forcing school boards to cut programs and close more than 200 public schools. More than 3,500 teaching positions, including 1,500 specialist teachers, were also cut. 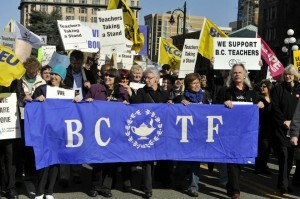 For more on Bill 28, the 2011 court ruling that found it to be unconstitutional, and the BCTF’s further action to seek a remedy, read http://www.bctf.ca/NewsReleases.aspx?id=30560. Madame Justice Griffin of the BC Supreme Court is expected to release her judgment at some point this spring. This entry was posted in BC Education, Contracts, Government, K-12 issues, Legal issues, Organizing, Students, Teachers, Unions and tagged BC education, BCTF, Critical Education, Government, K-12 issues, Teachers. Bookmark the permalink.